My friend wrote an article on why you should only take money from investors you can trust. It is a thoughtful post and it got me to reflect on my own experience. I continue to be surprised how nasty some investors get when startups begin struggling, get acquired on unfavorable terms, or fail. I am also surprised when I encounter bad actors: Investors and former employees who kill deals, attack founders, manipulate stakeholders, etc. How can we avoid toxic partnerships and bad actors? I believe founders and investors can avoid this by doing a better job assessing character, even during an often compressed fundraising timeframe . "Deliberate much before saying or doing anything, for you will not have the power of recalling what has been said or done." First, to assess character we need to define it. Character is the sum of qualities that define a person — ideals and flaws. To establish a platform for assessment, let us define character as integrity to a code of conduct, evidenced by the choices a person makes that lead to consistent, values-driven action. Next, we need to unpack that definition. While we can all generally agree that character revolves around doing the right thing all the time — daily choices of right over wrong — we have to understand that the ideals of a time period, culture, industry, or institution implicitly influence what is right or wrong . For example, ideals in Medieval Europe are different from today. Ideals in the United States Armed Forces are different from The Vatican. Ideals in Washington, DC are different from Silicon Valley. And so on. Since these ideals implicitly influence what is right or wrong, we cannot easily define them. To explicitly do so would take much longer than the length of this article, and would be subject to disagreement and render the point of this exercise useless. Instead, let us evoke the Golden Rule. Honor. Holding oneself to a course of conduct and dependability in all matters. Conviction even if it may lead to financial loss, personal loss, or humiliation. Having skin in the game. Veracity. Understanding the limits of one’s knowledge and ability. Saying and believing what one thinks to be true, even though it would be the path of least resistance to deceive others and oneself. Justice. Acknowledging and aligning the interests of all concerned in any particular transaction such that it evokes a sense of just behavior and treatment. Graciousness. Acting and speaking forthrightly; agreeing warmly, disagreeing fairly and respectfully; participating enthusiastically; refraining from harboring grudges; taking one’s suffering in stride. Integrity. Holding oneself to the same line of duty when unobserved as one would follow if all one’s peers or superiors were present and the interest in the good of a service is at all times greater than one’s personal pride. Identifying and defining values is only the starting point. Unfortunately, we cannot predict one's actions by simply reading or listening to what one values. For example, one can hold the value of integrity, but fail to act with integrity. This person values rightly, but is not virtuous. This habit is what Aristotle would call incontinence. The incontinent person knows what they ought to do, but fails to do it. This person thinks about it because they have the right values, but their desires are misaligned. We should also be particularly aware of virtue-signaling. This is prevalent in ephemeral situations like a compressed or fast-tracked fundraising or partnership process. Because we cannot rely on time to unveil the virtue of our actions, we have to signal it. For investors, this means seeking opportunities to confirm a founder’s values to get the allocation, deal, lead, etc. For founders, this means seeking discourse that confirms our values. Simply, virtue-signaling shows nothing; it is just marketing . So, now we know what to look for in another person and are aware of incontinence and virtue signaling. How do we cut through the noise? We find signal by cross-referencing values with action — looking at historical and present actions, and seeking to understand motivations for the most important decisions. "Just that you do the right thing. The rest doesn’t matter." True character is exposed when any one's values are at a breaking point. The breaking point is a stressful condition that forces someone to act (or not to act, but that is a separate matter) . Those in the military or who played high-level competitive sports understand that character is exposed — and hopefully built — under stressful conditions. If we want to understand the core essence of a person — what makes them tick — we must observe action or learn about one's action under conditions of stress and adversity. It is easy to act virtuously in a routine and predictable environment, especially when everyone is watching. It is difficult to act virtuously when we are alone, when our desires are misaligned, or when our environment is unpredictable or unfavorable. We had a strict no-hazing policy while I co-captained my college wrestling team. Many college sports teams across the country believe hazing to be initiation into the ideals of their institution. In our culture, it was disrespectful and pointless. Instead of hazing, we initiated freshman and tested their character through crucibles: Extreme physical fitness, stress, and adversity. I found that crucibles expose the core essence of a person. Does someone give up when facing imminent defeat? How do they handle themselves in victory? Do they breakdown after a loss? Do they act in a fit of rage at the first sign of resistance? Do they shut down while the rest of the team continues to push the pace? How do they treat others while cutting weight and restricting their water intake? Do they blame coaches? Do they complain? Do they fear competition or altercations? Crucibles shine a light on the inner nature of people. Crucibles expose character. I observed that how someone handled themselves on the wrestling mat is how they handled themselves off the wrestling mat. If you lacked character on the mat, you lacked character off the mat. It was that simple. Conversely, I know of no teammate who lacked character off the mat and discovered their character on the mat. It is the same in sport as it is in business and life. While crucibles are the ultimate equalizer, we are not going to run our future business partners through a new crucible. It would take too long and as fun as that would be — I love crucibles — it is not practical and would probably become a liability . Fortunately, almost everyone has had to endure their own crucibles. Learn more about those crucibles: Understand the context, the outcome, and how the person acted. "A diplomat will show you his ‘accomplishments’. Not what he failed to do." We should not approach every potential relationship with the assumption that the other party is out to get us. Instead, go into every potential relationship with default "I like you" then seek disconfirming evidence to identify people to avoid. Disconfirming evidence is the most powerful tool in establishing truth. First, we must do our homework before the initial meeting. Look up a startup or firm's website. Who are the startup's customers or what startups are in a firm's portfolio? Do they list values on their website? Look up a founder or partner's Twitter. What are their values? Establish a baseline. Ask an investor for their anti-portfolio. Ask an investor for deals they lost and why. Track records are overrated. Having connection with people transcends. Ask an investor for a company that went sideways and failed, and why they failed. Seek out that entrepreneur and see how they were treated by the investor. Ask a founder or an investor for their life story. Try to understand where they came from and how they got to where they are today. Ask probing questions and motivations for actions. Ask a founder or an investor for their anti-resume. Try to understand whether they are comfortable and truthful in recounting their failings, and who was impacted. Ask a founder or an investor to explain their most recent failure. Try to understand the people impacted and if you could reach out to them. During the discussion, identify moral flexibility and attribution errors. Can we identify any disconnect throughout the interaction? When a potential partner is exhibiting moral flexibility and attribution error during an interaction they can justify just about any behavior based on a belief that circumstance of the moment is what matters. This is a very simple way to uncover a disconnect between value and virtue. For example, you would not want to partner with someone saying they are fighting for others, but are actually fighting for themselves. "To recognize false merit, and crown it as true, because the long tail runs after it, is the saddest operation under the sun." At the end of the day, a business partnership is not a low stakes decision. To help us, we defined character, identified and defined our values, learned to watch out for incontinence and virtue-signaling, and came up with some tactics for assessing character in a compressed timeframe, cross-referencing action with virtue. Now, we have to make a decision. How do we know when to begin a business partnership? Detach from the emotional highs of a transaction and work with those who are worth emulating (and vice versa). While there are no perfect people, there are those who bring out virtue in others — that is the way of human nature. We have seen it in war, sport, and business — one’s minor shortcomings does not impair the working relationship of the partner who has found someone worth emulating. On the other hand, to recognize merit you must yourself have it. The act of recognizing the worthwhile traits in another person is the test and making of character. Those who scorn others and thinks no one else worth emulating parades their inferiority and sinks their own character into bankruptcy . Ironically, most of these bad actions are committed by people who would otherwise consider themselves altruistic. I do not claim to be on a moral high ground, but as a founder and investor I am disciplined to the belief that if a startup tries hard then an investor has no right to complain. It is a power law industry. The founders have already repaid the investor in effort. This is not where the returns are, anyway. This raises the argument of a person having good character, bad character, or no character. It would become a whole other essay. I have found that virtual-signaling and confirmation bias are a toxic combination. One party signals a virtue while another party seeks out this confirmatory evidence. This leads to vicious cycles. Startups are unpredictable and chaotic, thus stressful. You always get a better sense for how someone will act in a future stressful situation by understanding how they reacted in prior stressful situations. If an investor or entrepreneur is interested in creating or attending a crucible event, let me know! Taken from my personal notebook. I believe this is from The Armed Forces Officer. Thanks to Drew for reading drafts of this. 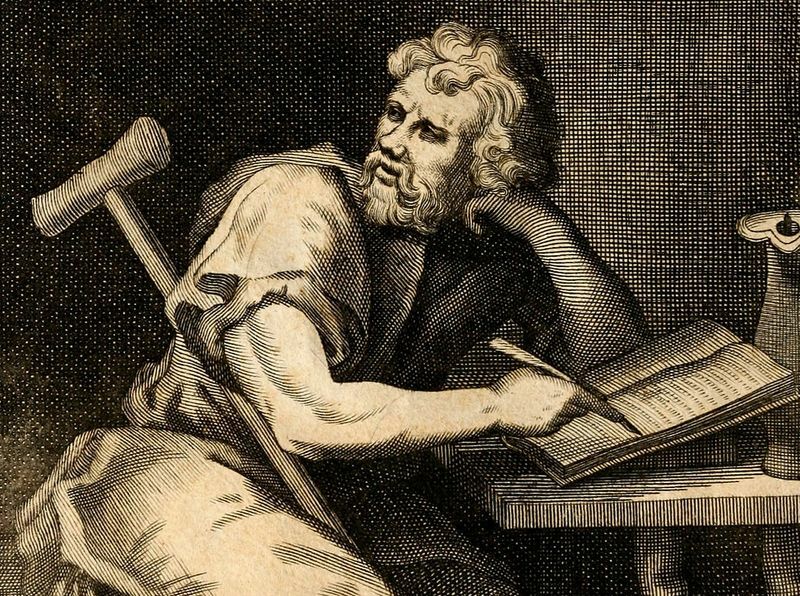 Cover image: Epictetus, prominent 1st Century Stoic philosopher. Image taken from Wikipedia.org.